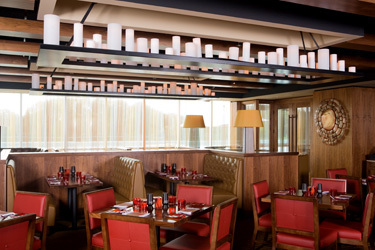 BOKX 109 American Prime is an award-winning, modern American steakhouse located inside Newton's Hotel Indigo. The 225-seat restaurant features an eight-seat Chef's table and three private dining rooms available for corporate and special events. The rooms accommodate 8-65 people, and each is equipped with a 52" plasma TV and WiFi access. During the warmer months the BOKX Pool Deck offers poolside dining by the fire pits and cabanas perfect for entertaining small parties. The BOKX menu features the finest cuts of sustainably raised, antibiotic- and hormone-free, corn-fed beef, local organically grown fruits and vegetables and innovative sides including wild mushrooms with black truffle and haricot verts with North Country bacon and pearl onions. Creative, modern American-style dishes paired with one of the most extensive wine lists in the area creates a dining experience like no other.